There is one dimension of the meaning of the cross that I want to highlight this morning, and that is the participation of all creation in the death and resurrection of Jesus. And the cross is not just a human event, it exists at the intersection of human and natural worlds. The cross is the crux, the point of connection, between God and Man, and between the universe and humanity. Through Lent this year we have been exploring aspects of creation, and seeking to understand more of God’s love for all the world, and our place in that. 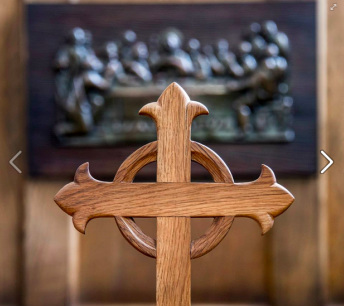 Through Lent we have of course been thrown deep into yet another aspect of creation, pain, violence, fear and suffering, through the events that have unfolded around us here in Christchurch. In terror and in hope, in tearing apart and in reconciliation, in words of hate and words of love, we have been witnessing the drama of the cross in ways we could never have predicted, never have even hoped for. We stand in these twin realities, beauty and violence. The cross stands forever as the intersection between good and evil. The cross is God’s word, begun in creation, born as a baby in a manger, nailed on wood, and burst free from a stone tomb. The cross is God’s investment in the world he has made, both human and universe. Not content to form the world from nothing, God chose to enter the world and become nothing within the world, so that we would not simply spin further out into the void, not spin deeper down into sin and destruction, but that we might step into life, life as God created it, life as God intends it. The created universe cheers us on. And in our suffering the created world groans, as Paul writes in Romans, creation groans like a woman in labour, yearning for the revealing of God’s people fully alive. And on the road to the cross all the created world seems to lean in to that moment, Jesus carrying that bloodied plank of timber. And as he hangs there on the cross, marred, disfigured, despised and rejected just as Isaiah prophesied, the sun hid its face, darkness fell, all the created universe holding its breath in that moment, then the earthquake shaking the temple, cracking rocks, tearing the curtain. This Easter time I pray that you will find space to get outside. Wrap up warm, go out for a walk, before the rain comes. Hear again the word of God speaking through all creation. Can you catch an echo of the groaning of the created world? It groans now more than ever before, weighed down with plastic and toxins. Bring to God all you have been through, your story of suffering and pain. Let it intersect at the cross with the saving redemption story of God. And bring to God all that you see around you, our earth’s story of renewal and destruction. Let it too intersect with the cross in the saving redemption story of God. This I pray for you this Easter time. NZ is reeling today in the aftermath of our very own terrorist attack. As 50 people lie dead and dozens more fight for their lives in hospital, we are all shocked and devastated. Psalm 7 is also strong stuff. ... and tough conversation HERE about how our own religious tradition, even the Psalms, can be read to fuel self-righteous hatred. Take Psalm 101 for instance. 8 weeks of reflections, with personal and practical ways to pray, exploring the Bible and critical current issues. Also I'm adding in lots more stuff into the Creation page in the God menu, including links to major websites. ... and lots of lovely photos! that the gospel of Jesus Christ is true! with scripture, song and silence.